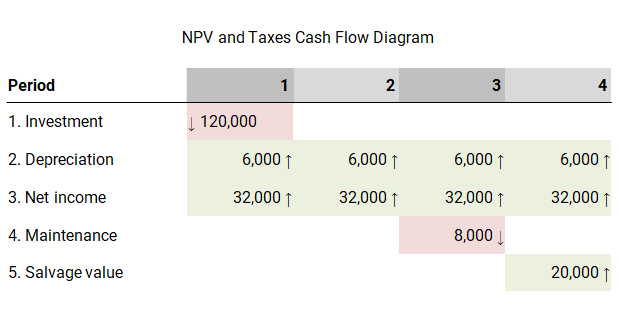 The NPV (net present value) of an investment is calculated by adding together the present value of each of the individual cash flows associated with the investment. This technique is more fully discussed in our net present value tutorial. The purpose of this tutorial is to discuss the effect of taxation on each of the investment cash flows and, as a result, on the NPV of the investment itself. The initial investment is a cash flow out of the business, the amount before tax is used as the tax effect is taken care of using the depreciation / tax allowances (see below). Tax allowances on the initial investment are normally given over a number of years. Often straight line depreciation is used as an estimate of the tax allowances. The effect of this tax allowance is to reduce the tax paid by the business, and this reduction can be viewed as a cash flow into the business. Salvage values on equipment used within the project are normally not taken into account when calculating the straight line depreciation or tax allowances. Operating expenses are tax allowable and therefore reduce the tax paid by the business. This reduction in tax is viewed as a cash flow into the business. Working capital increases needed for the project are normally returned after the project and there is no tax effect to consider. Salvage values on equipment used within the project are normally seen as a cash flow into the business at the end of the project. The salvage value is subject to tax, and the after tax cash flow should be used. One off costs such as maintenance charges are treated like operating expenses and are tax allowable, and therefore reduce the tax paid by the business. This reduction in tax is viewed as a cash flow into the business. To demonstrate the effect of tax on the net present value we will look at a simple example. Suppose a business invests 20,000 in an asset which will reduce costs by 9,000 a year for 4 years. For tax purposes the asset is depreciated on a straight line basis over 4 years. The business has a tax rate of 20% and uses an after tax discount rate of 6% to evaluate investments. The initial investment in the project is 20,000 at the start of year 1. The initial investment of 20,000 is depreciated over 4 years and results in a tax allowance of 20,000/4 = 5,000 a year. This allowance gives a tax saving of 5,000 x 20% = 1,000 a year for 4 years. The reduction in costs increases the net income of the business by 9,000 a year. However, this is subject to tax of 9,000 x 20% = 1,800, resulting in an increase of 7,200 a year for 4 years. The cash flows from the investment in the asset can be seen in the cash flow diagram below. The NPV of the investment in the asset is the sum of the present values of each of the cash flows. The positive NPV means that the investment in the project should be undertaken. Consider now a second example where the project equipment has a salvage value at the end of its useful life. The business uses the straight line method of depreciation and excludes salvage value when calculating tax allowances for depreciation. The tax rate of the company is 20%, and the after tax discount rate used by the business is 5%. The initial investment in the equipment is 120,000 at the start of year 1. As before, the depreciation on the equipment is 120,000/4 = 30,000 a year, which gives a tax saving of 30,000 x 20% = 6,000 a year for 4 years. The annual net operating income from the project is 90,000 – 50,000 = 40,000. The tax on the income is 40,000 x 20% = 8,000, giving an after tax net cash flow each year of 32,000 for 4 years. The one off maintenance cost after 2 years is 8,000, after allowing for tax of 8,000 x 20% = 1,600, the cash flow is 6,400. The equipment is sold after 4 years for 25,000, after tax of 25,000 x 20% = 5,000, the lump sum cash flow from the sale is 20,000. Finally, the NPV of the investment in the project is the sum of the present values of each cash flow as calculated above.